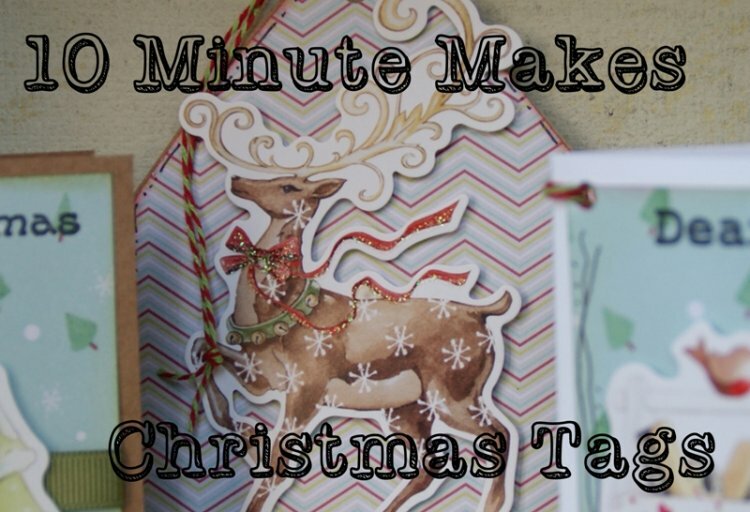 These festive tags will add a charming handmade look to your present wrapping and no one will have to know it only take ten minutes to make all three! 1. Cut a piece of card 18x9cm, score and fold in half , on the front cut a piece of the Santa’s Workshop tree paper 8x8cm and glue down. 3. Add ribbon or fineliner detail around the edge to make them standout. 4. Take your glitter sticker and on the back use foam squares to give it depth, double up the foam squares in the middle to give extra height. 5. Punch a hole in the top left corner and thread with twine. 1. Cut a piece of patterned paper 12x9cm, lay the paper so the short edge is facing you. Mark the middle point at the top of the paper, and then measure 8cm up on both sides. Starting from one of the 8cm marks cut up and round to create the curved tag shape. 2. Mount the paper on some Kraft card and cut around leaving a 5mm gap. 3. Use a fineliner around the outer edge to draw a decorative border of lines and dots. 4. Stamp your sentiment on the bottom of the tag, mount the reindeer sticker on foam squares and stick down onto the card. 5. Punch a hole at the top of the tag and thread with twine. Like this project then leave us a comment below and why not share your own version in our project gallery.